If you like this free game, try Persian Puzzle. In Rome Puzzle you have the chance to build Ancient Rome, the most legendary city of all time! Conquer over 100 intuitively designed puzzle levels by swapping tiles and matching three or more in a row. 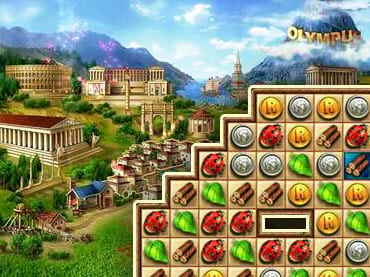 Play Rome Puzzle more and watch your city grow into a vast and magnificent center of life, the heart of the antiquity! In Rome Puzzle you'll be able to reconstruct masterpieces of Roman architecture, build the Coliseum to train gladiators, and even rebuild the Pantheon! As Rome grows, the citizens who populate your city will proclaim you a Roman Emperor! Download Rome Puzzle game, solve the puzzles that will be put before you, and you will enter Olympus - the Home of the gods! If you have questions about Rome Puzzle game, please contact us using this form.